Sister Janet Ryan, OSF of Precious Blood Ministry of Reconciliation recounts a recent experience participating in a Forgiveness Circle and the power this restorative practice have in healing and reconciliation within a community. At Precious Blood Ministry of Reconciliation (PBMR), we accompany one another through joys, sorrows, challenges and all that life brings to our Back of the Yards, neighborhood in Chicago. PBMR provides after-school programming using restorative justice and peace circles to provide hope, hospitality, and healing for court-involved youth and their families on the Southside of Chicago. Recently we invited our neighbors to join us in a Forgiveness Circle with the hope of creating a space to reflect on what prevents us from inner freedom, healing, and peace. There are many different types of circles: talking circles, healing circles, celebration circles, and conflict resolution circles to name a few. “Sitting in circles is rooted in the ancient tradition. Circles have been a common form for discussing issues of importance to the community throughout the ages and in our time. Circles provide support, generate mutual understanding, strengthen relationships and create spaces for healing and transformation” (“The Listening Center”, Circle Principles, by Kay Lindahl, 2014). In our case, about 20 of us gathered outside in our circle space located in our peace garden, near our labyrinth. After the welcoming, introductions and check-in, we listened to testimonies from two members of our community – one who had served time for his involvement in the death of a young teen named Pedro, and the other from Pedro’s sister. They shared how, about 25 years after Pedro’s death, their families connected through an eight-hour peace circle, and of the long process of reconciliation and forgiveness. Their stories were humbling and heartbreaking. We sat in silence, for several moments, honoring what we had heard. Then each of us was invited to jot down what/whom we needed to forgive or be forgiven by. Holding the slips of paper, we walked the labyrinth reciting the mantra, “I love you. I’m sorry. Please forgive me. Thank you.” When we finished, we gathered back in the circle where each person placed his/her slip of paper in the fire pit in the center of the circle symbolizing letting go of whatever prevented our hearts from loving, forgiving, and living in peace. Br. Juan, of Precious Blood, reminded us that we all have violence within us and that we are part of the violence in our neighborhood. We must choose to be intentional about healing and forgiveness. We closed with a checkout in which everyone spoke of the power of the circle and his/her gratitude for attending. 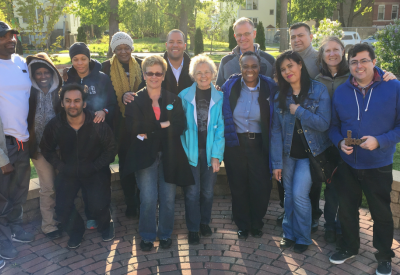 Darryn, a staff member from the Institute for Nonviolence Chicago, said, “I have been doing this work for a long time, and I have never experienced something like that.” Afterward, everyone came into the Precious Blood Center for food, drink, and visiting. Restorative justice calls us to not only consider how we are personally connected with crime and criminal justice but also with one another. Through encounter, transformation, and amends we may be transformed and honor the human dignity inherent in each one of us. Sister Janet Ryan, OSF, is the manager of the Education Lab at Precious Blood Ministry of Reconciliation and is trained as a circle keeper.